Get out of the way Nicki Minaj, this new girl is taking the rap world by storm! Her name is Iggy Azalea. Iggy has been in the music industry for a while but her single ‘Work’ was the song that put her on the map and has earned her quite a few loyal fans. 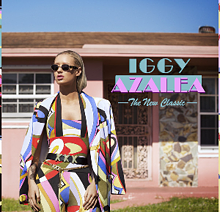 Her new album, The New Classic was released on 21 April 2014 and was number 3 on The Billboard 200 chart. The album features artists such as T.I, Rita Ora, Watch the Duck, and Charli XCX. A single off The New Classic that is making waves right now is Fancy, which features Charli XCX, where Iggy speaks about the kind of girl that she is. ‘Fancy’ is one of those songs with a catchy chorus that would have you singing over and over. As a bonus, Iggy uses scenes from the movie Clueless for the music video of Fancy. Another crowd favourite is her song Work. In Work, Iggy tells us about her life and how she has struggled to get to where she is today. She describes different kinds of ‘hustles’ that people go through in order to make it to the top.